What great fun to set off exploring the vicinity around San Blas, Mexico, in search of wildlife. The morning that Bob and I scoped out the shrimp ponds on the outskirts of this small fishing community, quite a variety of birds met our searching eyes, most of which we had never seen before. 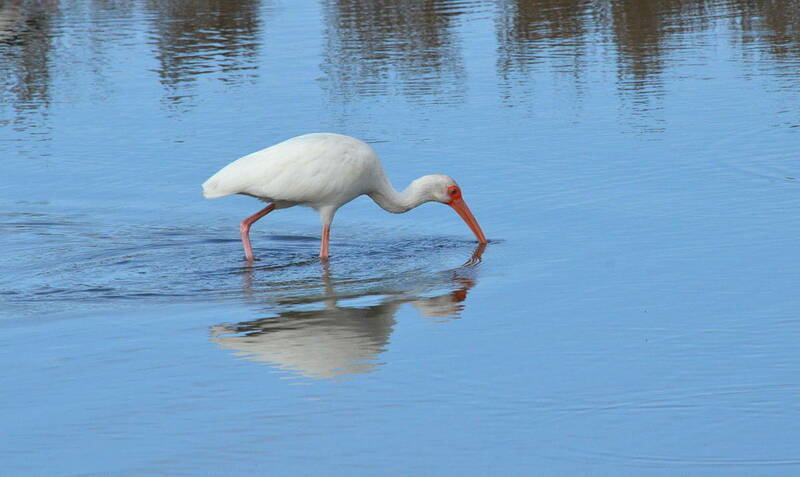 Among those plying the water for something to eat was this impressive White Ibis. 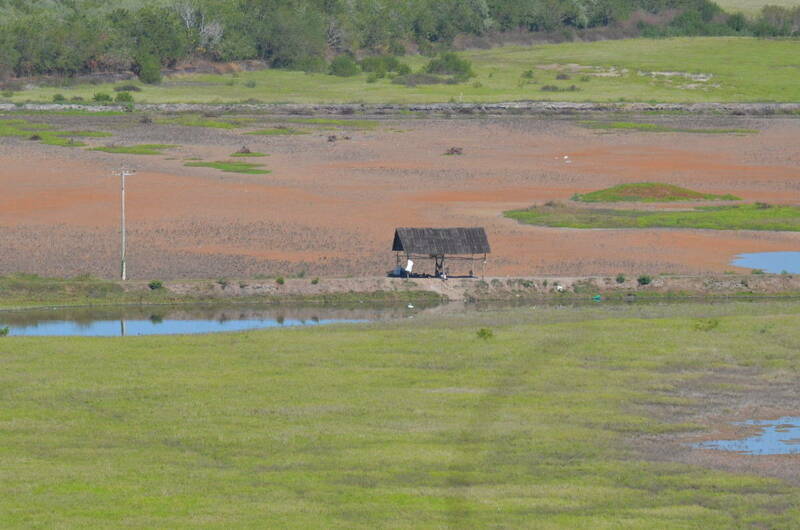 but once on site, the full scope of the artificial shrimp ponds became evident. Given their location, it was obvious that they had been converted from a section of the mangrove swamp that is prevalent in that area. 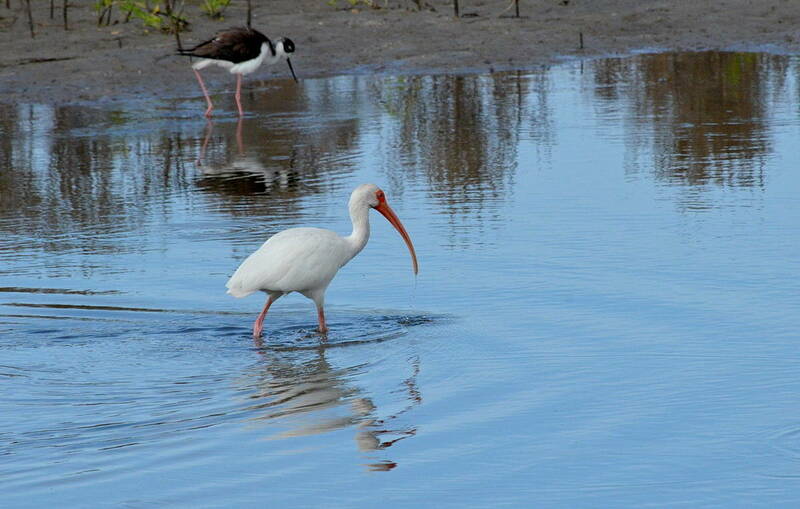 This White Ibis was knee-deep in the briny water of the man-made ponds that were rich in aquatic life. 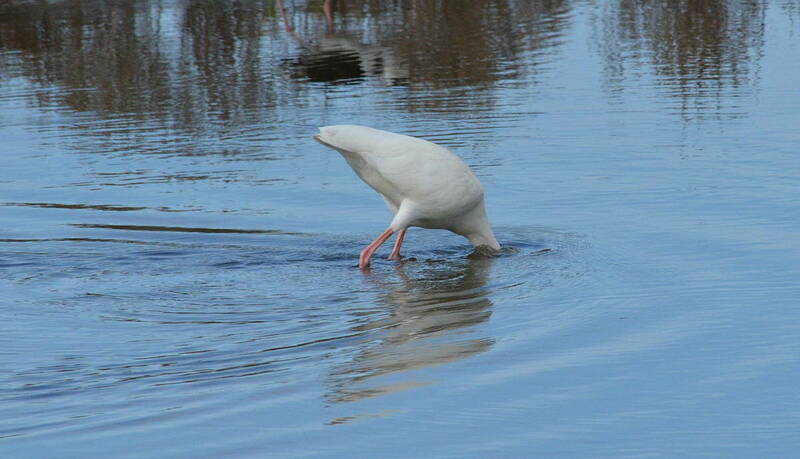 Foraging for a selection of small fish, snails, frogs, insects or crabs, a White Ibis moves slowly through the water and sweeps its bill from side to side. We watched as this Ibis methodically probed the muddy bottom of the pond, able to detect prey by touch with its tactile bill and capture it before the prey could elude its powerful mandibles. Moving in for the catch, this White Ibis did not need to see its prey but relied on its bill to locate, isolate and capture its food. 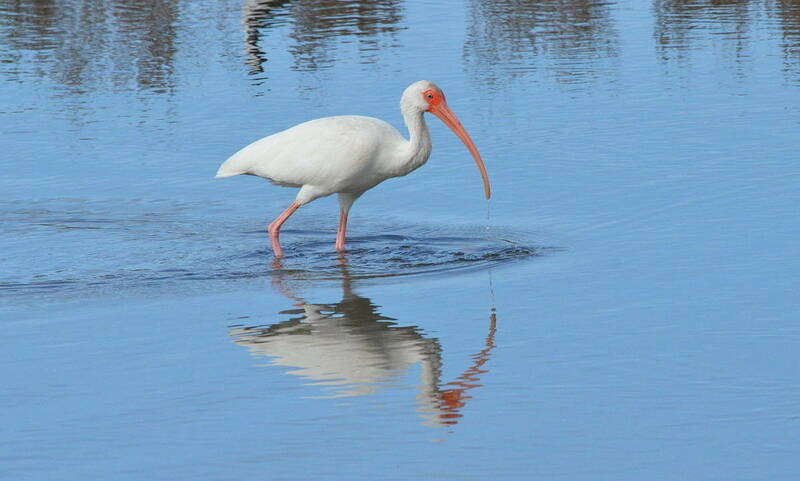 A White Ibis is a medium-sized bird that stands about 2 feet (0.6 m) tall. Its overall plumage is a brilliant white, and for me, the most striking characteristic is the long, down-curved reddish-orange bill that sprouts from a pretty pink face. 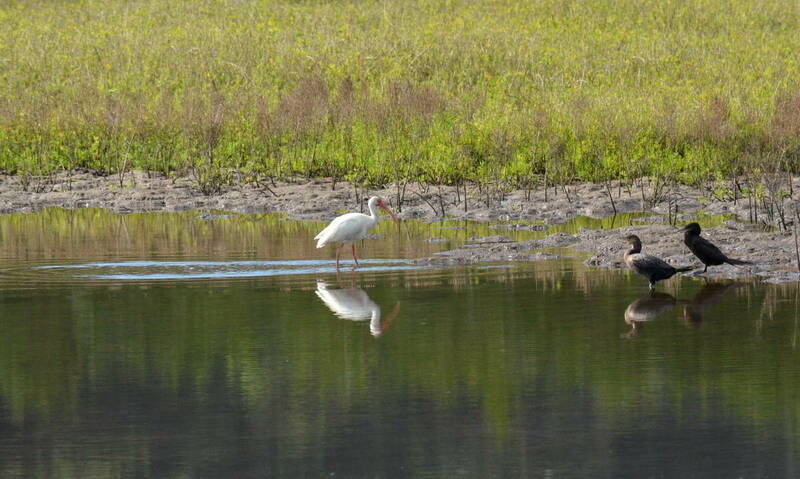 Bob and I were mesmerized by this unmistakable wading bird as it slowly patrolled the pond, and we soon scanned the environs to see if others were present in the pond or along its shore. 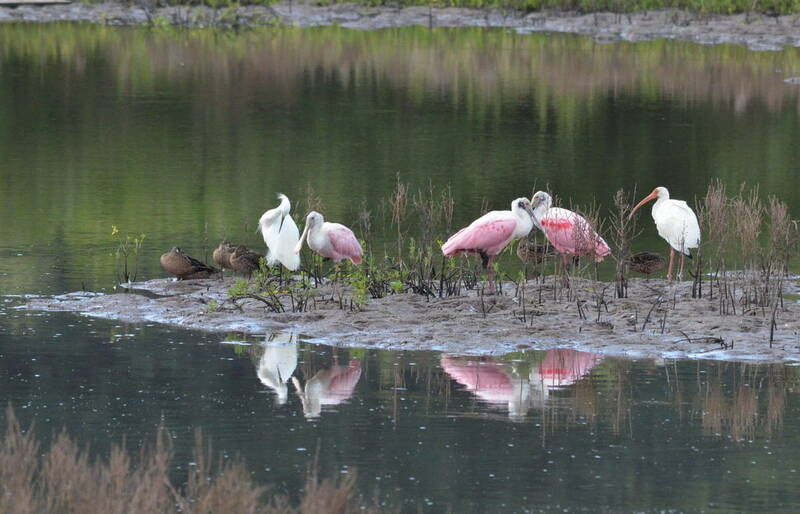 Another adult White Ibis had retreated to a muddy point where it was in good company with some Roseate Spoonbills and a Snowy Egret. 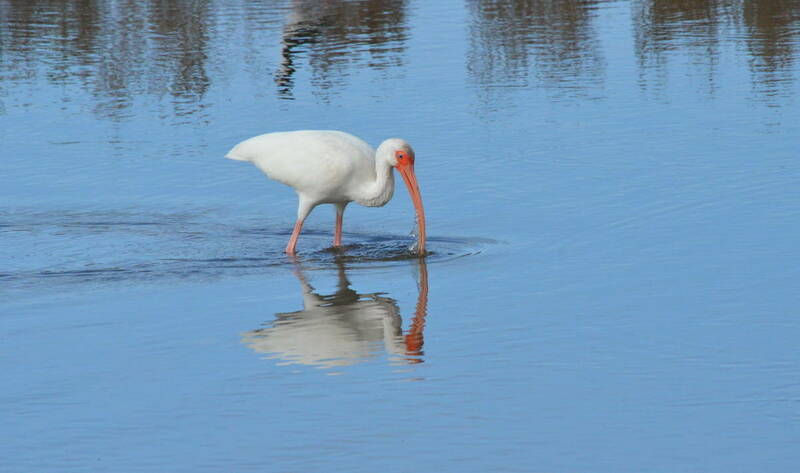 White Ibis also forage on land for terrestrial creatures like snakes and unearth crustaceans that have burrowed into the soft silt. distinguishable by its brown upper plumage and white underside. Depending on how young a juvenile is, its bill and legs are brown and gradually turn orange as they mature. I was pleased that this Ibis was on shore so we could get a look at its partially webbed feet that assist the bird in keeping its balance while treading on soft, muddy ground. 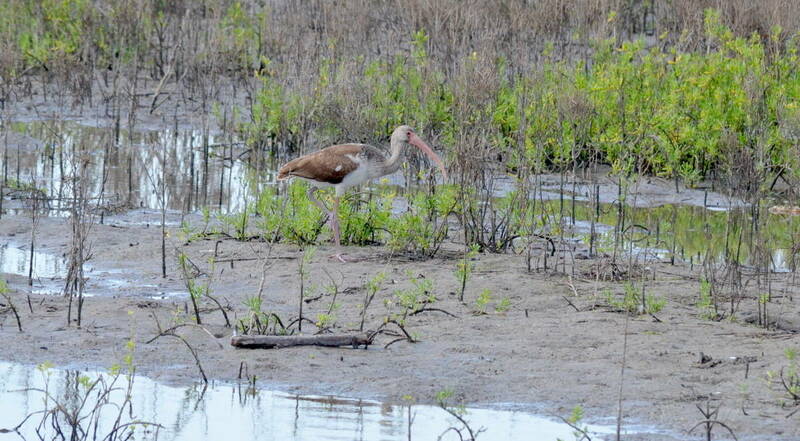 Over the course of 3 years, a White Ibis’s brown plumage will slowly be replaced by white feathers, although full adult size and weight is achieved by the end of a fledgling’s second year. 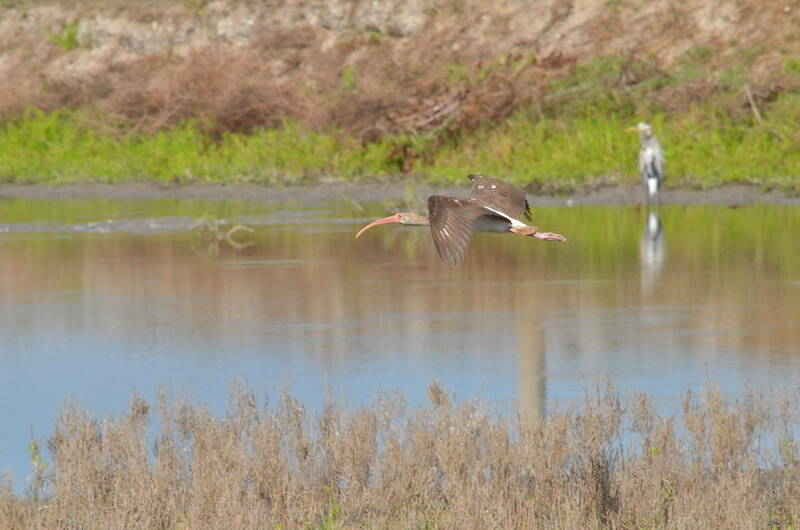 As one juvenile White Ibis took flight, we wondered if it was hoping for success in another section of the pond. Juveniles are much less adept at foraging than adults and will often congregate together to up their chances. 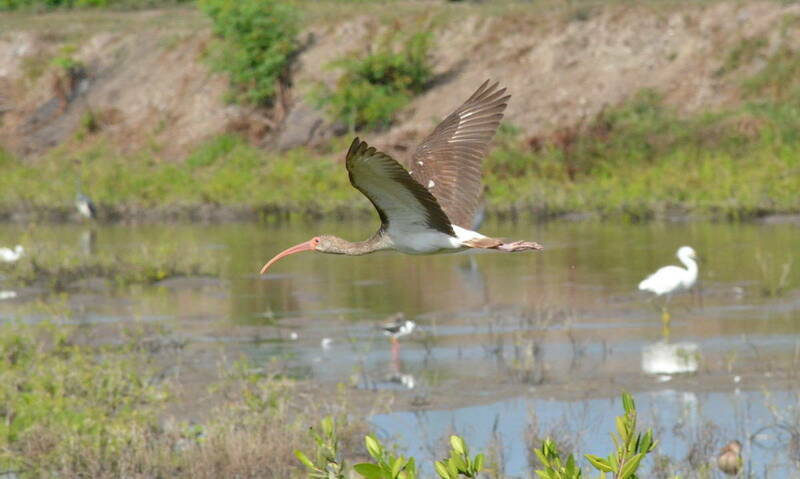 With a slow, graceful flight over the ponds, this juvenile White Ibis demonstrated the typical posture of the species when airborne…legs and head fully extended to reduce drag so less energy is expended. When flying en masse, like Canada Geese, a congregation or wedge of White Ibises will follow one another in straight lines and form a loose V formation to help reduce wind resistance. 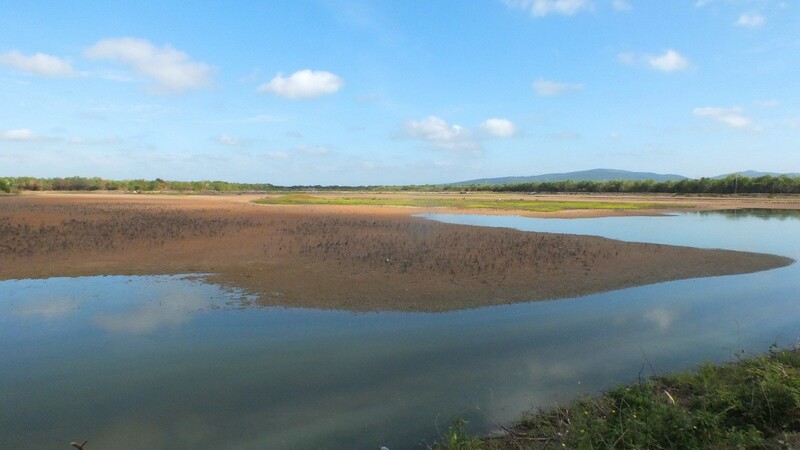 Bob and I really enjoyed observing the White Ibises, but there were many other species to discover so finally walked further out along the dykes.